Alexis Stenfors discusses his new book, which recounts his experiences as a rogue trader. During the global financial crisis, Alexis Stenfors was a rogue trader at Merrill Lynch, cooking the books to hide the millions he lost in the market. 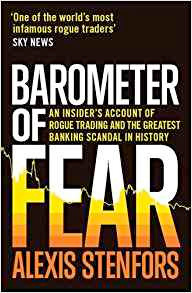 He recounts his experiences in a new book, Barometer of Fear: An Insider’s Account of Rogue Trading and the Greatest Banking Scandal in History. Stenfors is now a senior lecturer in economics and finance at the University of Portsmouth in England. He talked about his book on the Knowledge@Wharton show, which airs on SiriusXM channel 111. Knowledge@Wharton: In your role now in the teaching profession, what do your students ask you about your time as a rogue trader? Alexis Stenfors: They don’t really ask anything because I think they’re too embarrassed to ask. When I normally start off the first lecture or the first seminar during the new year, I introduce myself and briefly go over the period. It’s an icebreaker because once you’ve been labeled a rogue trader, then it’s such a big thing. I think most people are really afraid to ask, so I have to break the ice myself. Knowledge@Wharton: I read an article in which you talked about your experience and what you went through during that time. You alluded that you could be tempted to go back. Stenfors: I don’t think I’m tempted to go back. Technically speaking, I could apply for a license again because I got a five-year ban from the industry that was lifted a year and a half ago. It doesn’t mean that they would let me; the regulators could still say no. But I’m still very interested in financial markets. That’s what I teach. That’s what I’ve been researching. I write about it. Once you’ve been a trader for so many years, it’s very difficult to let go completely. I don’t think I would like to go back. It’s more the fact that people ask me, “Will you for certain never, ever try to go back?” I can’t say no. But it’s more like that. Knowledge@Wharton: Is that like being a gambler and being addicted to it? Stenfors: Addicted, yes. For me at least. I was very addicted to risk-taking, and I took a lot of risks within Merrill Lynch. Merrill Lynch was a big risk-taking bank at the time. The market as a whole took way too much risk in the run up to the financial crisis and during the financial crisis. I don’t think trading and gambling is the same thing at all because trading, in general, you always try to beat the market somehow. Whereas gambling, it’s almost like roulette, which trading is not. So yes, you’re right, there is an addictive element to it, which is also why I’m very reluctant to ever consider going back. I don’t think it’s good for me. Stenfors: Yeah. The title of the book probably has two meanings. One is the barometer of fear, which was coined by Alan Greenspan, the former Fed chairman. Technically speaking, you could buy and sell the fear, which was exactly what I did because I traded LIBOR index derivatives most of the time. They were very linked to the fear people had about the global banking system, so I personally, on behalf of the bank, betted on a worsening of the crisis. The more the crisis, the more severe it became, the more money I made on behalf of the bank. Of course, morally now looking back, that is very difficult to consider if this is the right thing to do. The fear that I talk about in the book is very much becoming rogue trading or being labeled a rogue trader. All of this also leads to a lot of fear because there are personal aspects of people that come up to you that say horrible things, and justifiably so. I had to deal with my own guilt, and I still deal with my own guilt, of having caused these losses. So, there is a lot of fear as well from a personal perspective, not only LIBOR itself. Knowledge@Wharton: It had an impact on your family, your wife and kids as well. Stenfors: Yes, of course. I think that’s the starting point of the book. It was eight years ago when that happened. I wrote down a few sentences on a hotel notepad. I thought, one day I will want to write a book for my daughters, who were six and eight at the time, to explain what it felt like being a rogue trader, what it felt like being a trader as well for 15 years and what it felt like afterwards because there was a lot of media reports about me, but I hadn’t written or said anything. It started off as a memoir to my daughters and gradually became something much more serious and thought through. Knowledge@Wharton: Talk about that period when you first realized the trouble that you could be in. I realized that something’s really wrong here because if you hide $100 million, which then became much more, you can’t be on holiday. You have to fly back home. I began to have doubts. I didn’t trust my boss anymore. But it was more the whole scenario about Merrill Lynch and the markets that I thought, I don’t want to be judged within a boardroom of a bank. I want to be open about this. So, I called a lawyer and it started from there. It was followed by many, many months of paranoia and sort of a Kafkaesque situation. Knowledge@Wharton: That’s a great description because $100 million is obviously a lot of money. I guess to you at the time it was like having dollar bills in your pocket. Stenfors: That is something I tried to explain in the book as well, that I traded derivatives and foreign exchange, and the amounts are so incredibly large. We are talking about billions and trillions. It doesn’t really matter if you are paid a lot as an employee. I was juggling with so phenomenally large amounts and also expected to make a lot of money during that year, so from that perspective, $100 million didn’t feel like a catastrophe. But then the bizarre thing is when I told him and thought about it afterwards, I thought this is absolutely mad. What have I done? It’s so much money. Knowledge@Wharton: What was wrong with LIBOR (London Interbank Offered Rate)? Stenfors: I felt at the time that LIBOR was not what people thought it was. I was suspicious of manipulation, not to the degree that we see now, of course. It wasn’t that firm. But it was enough for me to think I want to do some academic research on LIBOR. What is it and what should it be? Why is it wrong? I had traded LIBOR derivatives for so many years and know half of the people who have been on trial. That was really the starting point. What is the problem with it? Well, many problems. One was the fact that it was never a market. It was decided by a handful of banks or a dozen banks or a couple of dozen banks, depending on which currency it was. And it wasn’t binding. There was no binding rule where they put in those LIBORs. On top of that, this process, the governance was conducted by the bank lobby, the BBA in the United Kingdom. Of course a bank lobby would try to defend the banks, and the big banks were part of the panel. There were so many conflicts of interest. And the biggest trading banks of LIBOR derivatives were also on the panel. I wasn’t on a panel because Merrill Lynch wasn’t part of it, but all my major counterparties were. LIBOR is sort of a barometer of how good and sound the bank is perceived to be. During the crisis, it was a signal to the market whether a bank was able to borrow money. That also was something that disturbed me, or probably disturbed me more, the fact that I didn’t think LIBOR was correct during the crisis. I thought it was way too low. Even though it was higher than before, it should have been a lot higher. To me, if the LIBOR is manipulated by a lot, that means the central banks will act on wrong information. My theory at the time was that the central banks, like the Bank of England, reacted too late to the crisis in 2008-2009. Knowledge@Wharton: I understand from recordings in the LIBOR case that you were very close to being linked to this. Stenfors: Yeah. I think that was the second part of why I wanted to write the book. In 2011, two years into my Ph.D., I met a broker, sort of an intermediary, for a drink. He didn’t use the word manipulation, but he told me that he helped a trader with a manipulative scheme. That was Tom Hayes, who was sentenced to 11 years in prison later on. I felt really sick about this because I didn’t know how close it was. Even though I knew it might go on and there was manipulation out there, it felt a little bit too close. I realized afterwards that it was basically going on under my nose, if you like, and also by people that I traded with, billions of dollars every day. Knowledge@Wharton: Some of these people have stayed in touch with you? Stenfors: Some have. But again, I think I can relate to most of them. When I was labeled a rogue trader, most people did not want to stay in touch with me. If you are a banker or a trader, you don’t want to be associated with a rogue trader. Likewise for those who were closely linked to the LIBOR scandal, but also to the foreign exchange scandal that came a few years after, I think they became pretty isolated. I didn’t want to get in touch with them because I thought, well, if you want to call me then call me. Some have contacted me and we’ve had conversations, but I haven’t actively sought out and want to have a conversation with them. It’s really up to them. Knowledge@Wharton: You talk a good bit about the culture surrounding this industry. Has that culture changed where there isn’t this massive pressure put on traders daily? Stenfors: I think what has changed is the regulation. There’s been a lot of regulation since the crisis, but also since the scandals unfolded. There are many compliance officers, many lawyers. Many regulators are running around the dealing rooms, which is very different. It didn’t used to be like that. Back in the old days, I never met a financial regulator for 15 years. I think the pressure is still there to make money or to perform, but it’s different. The risk-taking is more constrained by the new regulations as well. I don’t think it’s possible to take that amount of risk that I did on behalf of Merrill Lynch in today’s environment, at least not in one of the big banks. Knowledge@Wharton: Because of the changes in regulation and the oversight, could a LIBOR scandal happen again? Stenfors: Probably in a different way. I don’t think it’s over. I think the LIBOR scandal might be over, but there was also an FX scandal. The largest markets on the planet, the foreign exchange market, was also manipulated. Then we had the gold scandal and a silver scandal. All of these markets that were sort of over the counter and very closely connected to what I traded have been subject to scandals. I think it’s definitely possible, but it would probably be in a different way. I think the regulation has done a lot to force banks to look at where could there be problems, what could the next problem be. But I don’t think it’s over, not at all. Knowledge@Wharton: In the United States, we still see instances of poor behavior by the banks. There’s been talk about President Trump easing regulation around big banks, and there’s a concern that we could see another kind of financial crisis down the road. Looking at the American perspective and industry, do you see that as a possibility? Stenfors: It depends on which area you look at. What I do research on now that is not directly related to the book is high-frequency trading and algorithm trading in the foreign exchange markets. I don’t bring it up in the book because it’s a fairly new thing in the foreign exchange market. There’s been a trend towards machines or robots from human beings. These scandals in the foreign exchange markets justifies the use of more machines because humans have misbehaved. We know this. Therefore, I think there’s more pressure on banks to make things more computerized. But when you look closer at the algorithms and the high-frequency trading, there could also be misconduct there. I think it’s just shifting to new areas. And I don’t think it’s safe yet to say the scandals are over, it was only a few rotten apples, the culture was bad in the old days, now everything is clean. I think it’s way too soon to do that. Knowledge@Wharton: I would imagine that one of the sobering thoughts is the fact that people like Tom Hayes went to prison for what they have done. I would imagine that your mind has ventured into that realm of what would have been if you were one of those people who went to prison. Knowledge@Wharton: There is an element of risk-taking in this industry that’s not going to go away. Stenfors: Yes. Coming back to your question about U.S. regulations or splitting up the banks, banks will always take risk in these markets because they work with money. It’s different when we talk about stock markets where you can say, I have 1,000 Apple shares and I sell every single one. You can’t do this with money. You can’t square up your risk or your position completely when it comes to these instruments, LIBOR index derivatives or foreign exchange, because that’s what banks do. They do take risks and are active in the money markets. I think the issue will always be there, it’s just a matter of how do the banks themselves go about to make sure this doesn’t happen again? Stenfors belongs in jail right next to Hayes and to think he is even allowed on a campus of higher learning possibly affecting young impressionable minds is insane. He may only feel guilt, which I doubt he sincerely does, because he got caught and for no other reason! Want to assuage your guilt, pay back all that you stole from the people you stole it from.